Vila Vita Parc resort in Porches has become the first establishment in Portugal to open a spa in collaboration with the iconic French skincare brand, Sisley Paris. 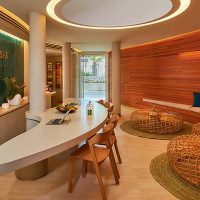 Entitled ‘Spa by Sisley’, the recently-launched spa marks the end of the resort’s renovation works which have been carried out in phases for the last four years. Described as a “wellness wonderland”, the 1,600sqm spa is located in the already existing spa building and boasts 14 treatment rooms “equipped with the latest Gharieni treatment tables” and an “ample and bright fitness studio with glass walls and a view of the resort’s luxurious gardens”.